Description Apply data-dependent scaling to a volume. When applied to gathers, lateral smoothing can be applied to the scalar calculation to avoid the impact of noise. Note: For Data Independent gain functions, use the Gain process instead. 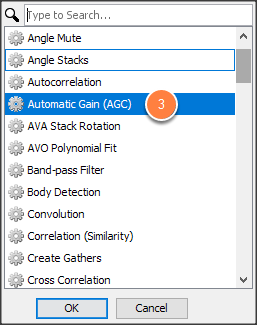 Scroll down and double-click on Automatic Gain (AGC). Median Mean: Specify the Percentage trim value. [Optional] Enter in the Clip scalars. Enter the Window length (ms) and Window overlap (%). 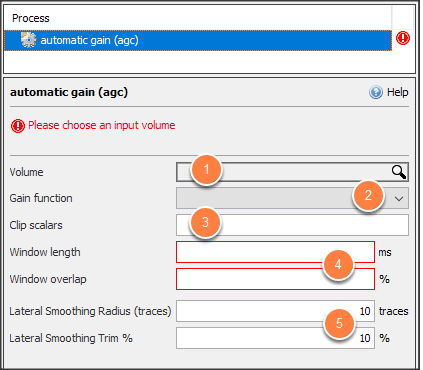 Lateral Smoothing: Smooth the calculated gain over a sliding window before applying. Applies to gathers and panelled data only. Set this to 0 for stacks and other non-gather volumes. Lateral smoothing is not applicable to “non panelled” data. Radius (traces): The size of the smoothing window. Trim (%): The percentage of outlying samples to discard from the smoothing window. Note: To reverse the gain, use Volume Maths (Simple) process to divide the gained functions by the scalars.